Southland students are getting the chance to interact with students abroad without the cost of heading overseas. Southland Girls’ High School has teamed with Changshu International School, Suzhou, China to offer students a cultural experience. On Friday the two schools had their first lesson through Skype call where they discussed in groups issues that were important to New Zealand and issues important in China. Southland Girls’ principal Yvonne Browning said it was important for the students to have conversations with counterparts in China about issues that were important in each country, to understand the global connection, to have tolerance and patience with other cultures and to “bring the world to Southland”. “China is a world leader and we are a country that needs to have strong international connections, and what better country than China. “We’re working that global connection … we just love the fact that we have connected with China,” Browning said. The aim was to build a lasting relationship with the country and the “top-notch” school. 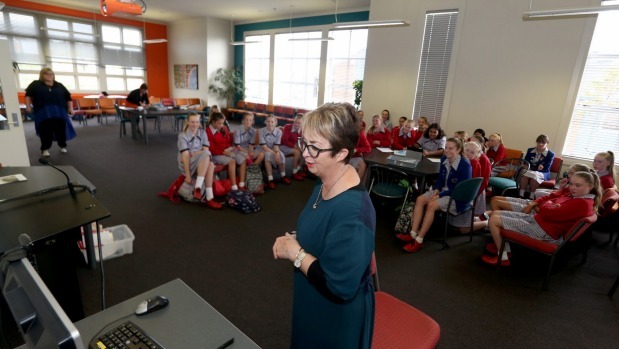 Southland Girls’ global perspectives teacher and international students academic tutor Sharee Ineson said the programme would teach the students life lessons about working in collaboration with people of a different culture, have cultural empathy and understand different perspectives. The advantages of online classes was having an instant and regular connection, there was no cost and it was inclusive of everyone interested, she said. There were 24 students on each side who split into groups of six, made up of four year 8 students and a year 9 or 10 global perspectives mentor. The students were self-nominated or were nominated by teachers to take part in the opportunity, she said. The idea came after a visit to Southland Girls’ from Changshu International School’s general principal Lunhau Cao (Charles), who is also a general principal of three other schools. After the visit, Lunhau was interested in an exchange programme but for convenience, cost and opportunity for more students the schools decided to start regular lessons online, Ineson said. Skype lessons would run about once a month but the schools would also do their own individual lessons. At the first lesson students looked at sustainable developmental goals with issues including health and well-being, clean water and sanitation, climate change, poverty and the economy.